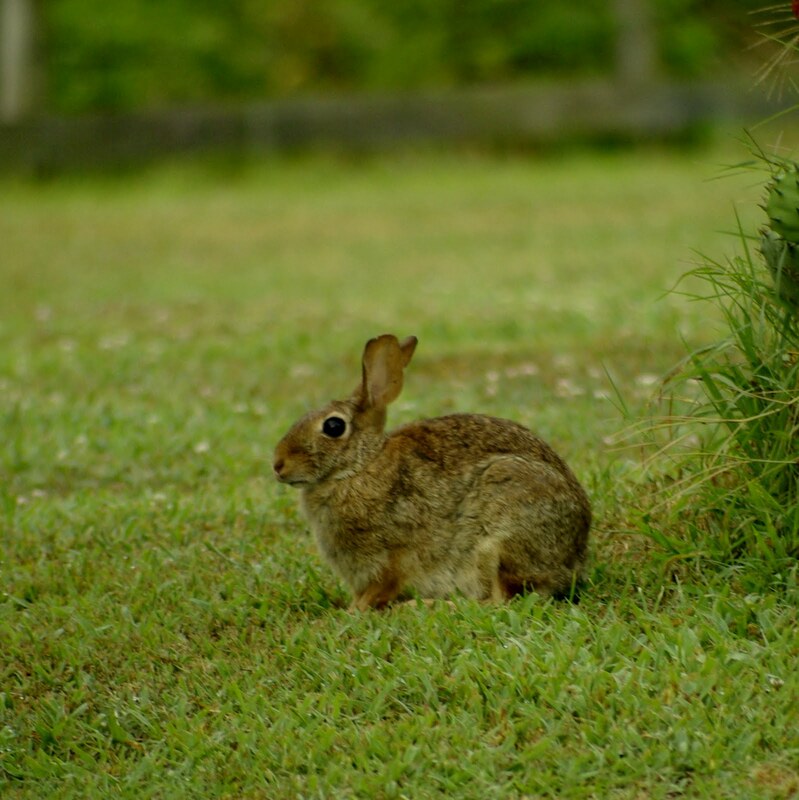 Rabbits hop around unafraid of those big, bad hawks. This morning when I took the dogs for their walk, there were three red shouldered hawks in the yard. Two were sitting on the fence and one on the grapevine. As we walked in the direction of the fence I realized one of the hawks on the fence was sitting right above Ms. Cottontail. She scampered a couple of feet away and stopped and stood totally still. The hawk didn’t move, I didn’t move, the rabbit didn’t move. The dogs did! Ellie ran toward the fence and the hawk flew away and Ms. Cottontail sat there about two seconds and headed for shelter under the shrubs. I don’t think the hawk was really too interested in having her for his breakfast, as she is a bit too large for him to carry away. But I’m sure she didn’t want him nosing around finding her littles. I love living in the country…always some kind of drama to be found on a morning walk! Here is Ms. Cottontail in a photo taken a few weeks ago. P.S. Just as I was about to hit the Publish key, something caught my eye in the container garden. It was one of our young hawks, sitting on top of the chiminea where I had placed a begonia that was looking a bit pititful. He was eating the begonia leaves or at least that is what it looked like. Probably there were insects around the plant and he was snacking on those. I got some photos out of the kitchen window and will post them tomorrow, if they turn out well. Like I said, always a bit of drama in the country! Blessings! Love, love, love that scripture!!!! Your place sounds amazing!! !